Is This the George W. Bush Version of Hillary’s Deplorables? RUSH: George W. Bush did not say much of anything for the eight years of the regime of Barack Hussein O. He didn’t write a letter. He often said, “Hey, I had my eight years. I’m not gonna comment on my successor. It’s not the way we former presidents do things,” unless you’re Bill Clinton or Algore; then you do. But George W. Bush never did. I don’t think Bush had anything to say about Clinton when he took over in 2000, and I don’t think he had a thing to say while Obama was unwinding his agenda. And this, again, is something I don’t understand. If it were me… I just put myself in these guys’ shoes. If it were me, and I ever ran for office, it would not be because I want to live in the White House, want fame, want power. It would be because I am obsessed with advancing my agenda and building America or reforming it to be what it should be and why I thought that I could get elected. And if I did get elected, and if I had any kind of success at all, I don’t know how I would just be able to sit by silently and watch somebody lie about it and unravel it. But that’s the rule, and that’s what ex-presidents do. And, now, Obama is perceived as doing that, but he really isn’t. Obama is guiding, Obama is instrumental in all of these efforts to undermine Trump. He’s just not seen. He doesn’t do it personally. He doesn’t go on television personally and do it. He has surrogates. Many of his surrogates are still deeply embedded in the bureaucracy known as the deep state. Eric Holder and all these other holdovers are still out there and they’re doing everything they can to undermine what Trump wants to do. GEORGE W. BUSH: Bigotry seems emboldened. Our politics seems more vulnerable to conspiracy theories and outright fabrication. We’ve seen our discourse degraded by casual cruelty. At times, it could seem like the forces pulling us apart are stronger than the forces binding us together. Argument turns too easily into animosity. Disagreement escalates into dehumanization. We’ve seen nationalism distorted into nativism, forgotten the dynamism that immigration has always brought to America. 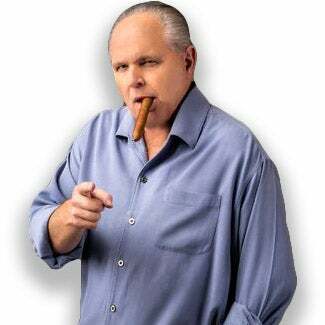 RUSH: Well, okay, uh, “the dynamism that immigration has brought to America.” I have a stat. I saw this the other day. It’s one of these things I knew but I didn’t know. I said, “Yeah!” It shocked me, but then when I stopped and thought about it, it had to be true. The U.S. immigrant population has hit a record 43.7 million in 2016. One-out-of-5.5 — one out of five and a half — Americans is an immigrant, legal and illegal combined. One out of five. That’s not dynamism. That is an invasion that has been ignored and you might even say covered up. It is a trend that a majority of Americans oppose and that’s why Donald Trump was elected. But that’s not it. George W. Bush says, “Bigotry seems emboldened.” Too much bigotry out there. “Our politics seems more vulnerable to conspiracy theories” only on Twitter “and outright fabrication.” That’s the Drive-By Media, Mr. President. They’re the ones making stuff up. “We’ve seen our discourse degraded by casual cruelty.” I know that all of this stuff is aimed at Trump, but in truth, you could lay all of this at the feet of the Democrat Party, the American left, the media. “At times it could seem like the forces pulling us apart are stronger than the forces binding us together.” That’s not… What’s happening here is there was a phony, false, plastic banana, good-time rock ‘n’ roller effort to force people together. It’s not to create unity but to force people together by punishing certain elements of our society and labeling them and criticizing them and claiming they had to take one for the team! There’s a way you go about promoting unity, but that’s not what this has been. This has been a forced: “You will accept this and you will like this or else,” and all of that happened against the will of the American people. When they couldn’t get the votes for doing this, they found other ways of changing immigration law or largely not enforcing it. “We’ve seen nationalism distorted into nativism.” So George W. Bush is… He’s calling out Trump voters here and Trump. Here’s the next bite. There are two more together. GEORGE W. BUSH: America has experienced a sustained attempt by hostile power to feed and exploit our country’s divisions. GEORGE W. BUSH: According to our intelligence services, the Russian government has made a project of turning Americans against each other. This effort is broad, systemic, and stealthy. It’s conducted across a range of social media platforms. RUSH: Holy smokes! Are you kidding me? The Russians have infiltrated our politics! The Russians have been trying to infiltrate — and they’ve succeeded — college campuses for decades. But this? “America has experienced a sustained attempt by a hostile power” that’s Russia “to feed and exploit our country’s divisions. It’s conducted across range of social media platforms.” Mark Penn — who is the pollster for Hillary Clinton, but the guy seems embarrassed to be in any way associated with her. Did you see what he said the other day? GEORGE W. BUSH: Our identity as a nation unlike many other nations is not determined by geography or ethnicity, by soil or blood. Being American involves embrace of high ideals and civic responsibility. We become the heirs of Thomas Jefferson by accepting the ideal of human dignity found in the Declaration of Independence. We become the heirs of James Madison by understanding the genius and values of the U.S. Constitution. We become the heirs of Martin Luther King Jr. by recognizing one another not by the color of their skin but by the content of their character. This means that people of every nation, race, ethnicity can be fully and equally American. It means that bigotry or white supremacy in any form is blasphemy against the American creed. RUSH: I don’t know. What is this, the George W. Bush version of Hillary’s deplorables? RUSH: This is Jeff in Colorado Springs. I’m glad you called, sir. How are you doing? CALLER: Oh, huge dittos from a glorious day in Colorado Springs, Rush. It’s great to be talking to you. RUSH: I appreciate that. Thank you much. CALLER: Yes, sir. I’d like to go over two points real quickly and get your analysis. The President Bush commentary really bothers me. So I really wanted to call in and find out your thoughts on this, one of two things: Is this payback for Jeb? As soon as I say that, it seems like that’s just too shallow to be true. But there seems to be an element. Or is this what you said before: The establishment, which fights under no flag, neither Republican nor Democrat? The establishment fights under their own flag and “no one like him is gonna come in and take this away from us,” is that what this is about? And now President Bush is wholesale bought into that and that was the attack today? It’s just something on my mind and I really value your analysis on that. RUSH: Of the two options that you present, I would tend to think that your second option is the more accurate of the two. But let me ask you a question about this. RUSH: And in the form of asking you, I’m gonna be asking everybody. Do you remember the eight years of George W. Bush where he was routinely maligned and impugned and insulted? He was called a liar. He was called a dunce. He was called a cowboy. He was called an idiot. RUSH: There were books and movies made which were applauded on how to assassinate George W. Bush, and a movie in Canada that actually portrayed that incident: Bush being assassinated. The media said that all of these books and movies had artistic value that we should study and learn from, because they explain the ongoing rage. And then in particular the second term of Bush, the final four years, do you remember the ongoing effort of the combined media, Democrat Party, to actually destroy the Bush war effort in Iraq and to secure defeat? RUSH: Do you remember all that? RUSH: Do you think Bush does? CALLER: I do, and that’s my query: Why now does it seem like he’s being embraced by that same conglomeration that tried to destroy him? “Because now he has an anti-Trump message, so let’s embrace this guy.” To me, that is the definition of establishment. RUSH: Well, now, whoa, whoa, whoa, whoa. Wait a minute. Who’s embracing who? Which went first? RUSH: Wait. Hang on a minute. Hang on. Our phone system is such that when I’m speaking, you can’t hear me. So it’s why I have to keep talking to interrupt you and catch you when you take a breath. I’m sorry for that but that’s just how it is. CALLER: No worries. No worries. RUSH: My question: Which came first? Did Bush embrace the establishment by making the speech, or is he now being embraced by the establishment because he made the speech? Which happened first? CALLER: The latter. I believe the latter. But it’s a courtship. It’s a dance. And over the last few years, you’ve seen less and less anti-Bush rhetoric, and therefore perhaps a door opened for him to now come in — with that maybe crack in the door or even fully opened — and go and do a speech like we saw today. I’m confused. I don’t know. It caught me off guard, but it was the spin up of this speech and the media that really caught my attention. RUSH: Well, I… Wait. I still go back to my question here, ’cause I’m not sure you’re right. I’m not sure that the first thing that happened here was the media embracing Bush. I think the first thing that happened is Bush makes a speech. Then you ask, “Okay, who wrote that speech?” Well, one of his big speechwriters, one of his most acclaimed speechwriters (particularly in his first term) is Michael Gerson, who is one of the de facto leaders of the Never Trumper movement of the so-called Washington conservatives. He now writes columns for the Washington Post in which he routinely savages Trump and pro-Trumpers and so forth. Did Gerson write this speech or did some other Never Trumper write this speech? But the point is: Bush gave it. You can say what the media is doing in reaction, but Bush gave the speech. So you think that Bush, by giving the speech, is trying to get back in the good graces of the crowd that savaged him and ridiculed him and destroyed him? CALLER: I don’t know, and that’s why I called in. I needed your thoughts on that, because it is so confusing to me that that happened today. I’m still trying to assimilate and process this. RUSH: Well, I’ll just give you a shortcut here. I don’t think that’s what George W. Bush is doing, ’cause I don’t think Bush needs to be ingratiated in the club. He’s always been in it, and what happened to him is what Republicans in the club acknowledge is going to happen if they’re in the club and if they’re Republicans. I saw so many things. Russ Feingold was one of the most vicious… He was a senator from Wisconsin. He was one of the most vicious, mean-spirited, extremist critics of George W. Bush I can remember. The cameras were outside the House chamber after a State of the Union speech, and there was Feingold sucking up to Bush and asking to pose for photos and asking for autographs. This guy was literally trying to destroy Bush in public, and Bush put his arm around him and slapped him on the back and they looked like best of friends. It didn’t make any sense to me just in the sense of human nature, unless everybody acknowledges that both guys are doing what you do when you’re in that club and both people are playing their roles and there’s a mutual respect just for being in the club. It didn’t make any sense to me. Bush didn’t say anything for eight years of Obama and now comes out and doesn’t just hit Trump. He never mentioned Trump’s name, by the way. We must remind you that he didn’t mention Trump’s name. But in the process, the things he said were pretty critical of the American people too. White supremacy? There’s no “white supremacy.” White supremacists couldn’t fill a phone booth in this country. There aren’t enough of ’em to affect the outcome of anything, and yet they become a central element of a major speech by a former president. Well, now, who’s created that myth? Well, it’s right out of the swamp. It’s right out of whoever’s running it: The media, Democrat Party, what have you. Look, I have to take a break. I’m a little long. But I’m glad you called. I hope that the analysis here got you halfway home and you can finish it up yourself. But there’s no real way of knowing. Time will tell.